Poor insulation is a major cause of premature aging of any home. Without adequate insulation, your home will not be as efficient and comfortable because of unstable temperatures. This leads to higher energy bills because your heating and cooling work overtime just to compensate. The best roofing constructor in the area, Enchantment Roofing, offers insulation services. 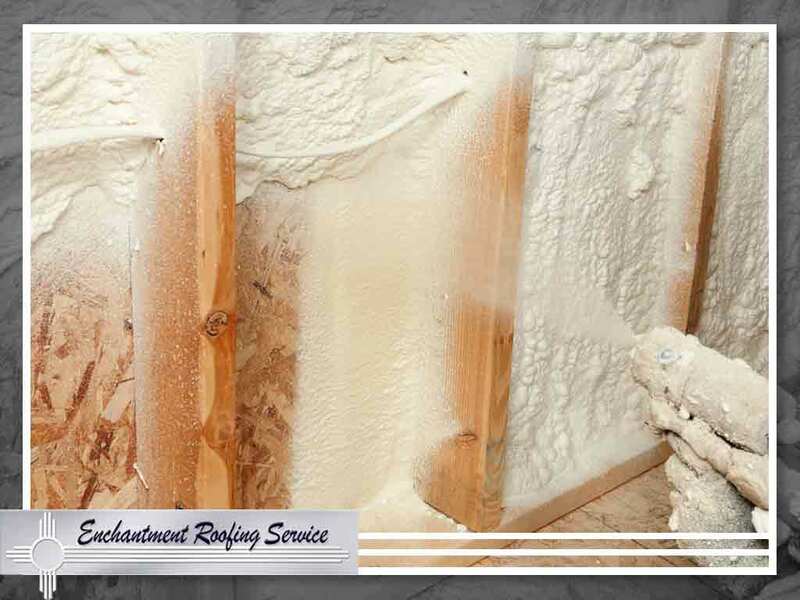 In fact, our spray foam insulation offers excellent protection and exceptional comfort. In today’s post, we discuss this type of insulation and why it simply works. Also known as spray polyurethane foam (SPF), spray foam insulation uses polyurethane as an airtight sheet of insulation, unlike blown-in insulation, which uses a mix of fiberglass and cellulose. SPF offers a higher R-value per inch, which means it can withstand higher heat than its contemporaries. Like most of its kind, however, SPF expands up to 10 times its size when it comes into contact with air and fills up the shape and size of its container. SPF has two main kinds. The first is called a one-part foam, which comes in pressurized cans that are available from your local hardware store. Apart from it being readily available, its main advantage is its excellent adhesion, ensuring an airtight barrier for your attic or any surface. The second kind, on the other hand, is a two-part foam, so-called because it uses a combination of resin and a catalyst. When mixed, they will expand to cover all the areas your residential roofing company needs to reach. Homeowners and contractors favor spray foam alike because of its benefits. One such advantage is the liberal application, allowing to be packed into space no matter how tight. With its aforementioned high R-value, it also deflects outside heat better than its competitors, leading to bigger energy savings. Whether you’re looking for home insulation or general roofing services, turn to Enchantment Roofing, your residential and commercial roof repair service expert. You can reach us at (505) 780-4616 to request a free estimate. We serve Sante Fe, NM and nearby areas.